Making a wrong notch is costly in both time and money. 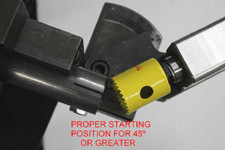 Using a common holesaw type notcher such as the NotchMaster by JD2, we'll outline the following procedures to help simplify and hopefully make for a better and closer fitting notch for many a fabricator. These procedures work - regardless of the angle and regardless whether the joining tubes are parallel, divergent or skewed.